Both the Ecomuseum sites of Church of St Michael the Archangel and Framlingham Castle are steeped in history. The church is the family parish church and burial site of many of the Howard family including Thomas Howard, the Lord Admiral, and also his father (Thomas Howard the 2nd Duke). This church also holds the ‘Flodden Helm’, the burial helmet of the 2nd Duke (it is not confirmed that he actually wore this helmet at Flodden). Framlingham Castle is the family seat of the Dukes of Norfolk, though not of the Earl of Surrey (later the 2nd Duke) as at the time of the battle he was removed from the title as he and his father had sided with Richard III at the time of the Battle of Bosworth. You cannot stand in the chancel of St Michael’s Church without sensing how close you are to the tense history of Tudor England. The chancel was built to serve as a mausoleum for the Howard Dukes of Norfolk, replacing Thetford Priory after the dissolution of the monasteries by Henry VIII in the 1540s, and it was the 2nd Duke, then the Earl of Surrey, who with his sons Thomas and Edmund led the English army in that terrible Battle on the Scottish borders 500 years ago. Restored to the Dukedom by Henry VIII after the victory at Flodden, the old Duke was from then on treated with a deference usually reserved for princes of the blood. His burial in 1524 was the last great funeral of its kind in medieval England with a 900 strong procession from Framlingham. The funerary helm, with its lion crest, was borne by Windsor Herald. This helm now hangs high on the south wall of the chancel, a tangible reminder of the magnificence of his funeral. The castle is situated in the market town of Framlingham in Suffolk in England. An early motte and bailey Norman castle was built on the Framlingham site by 1148 but this was destroyed by Henry II in the aftermath of the revolt of 1173-4. 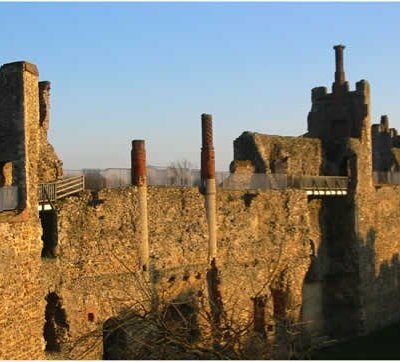 Its replacement, constructed by the Earl of Norfolk was unusual for the time in having no central keep, but instead using a curtain wall with thirteen mural towers to defend the centre of the castle. Despite this, the castle was successfully taken by King John in 1216 after a short siege. By the end of the 13th century, Framlingham had become a luxurious home, surrounded by extensive parkland used for hunting. During the 15th and 16th centuries Framlingham was at the heart of the estates of the powerful Mowbray and Howard families. Two artificial meres were built around the castle, which was expanded in fashionable brick. With a large, wealthy household to maintain, the castle purchased supplies from across England and brought in luxury goods from international markets. Extensive pleasure gardens were built within the castle and older parts redesigned to allow visitors to enjoy the resulting views. By the end of the 16th century, however, the castle fell into disrepair and after the final Howard owner entered into financial difficulties the castle and the surrounding estates were sold off. 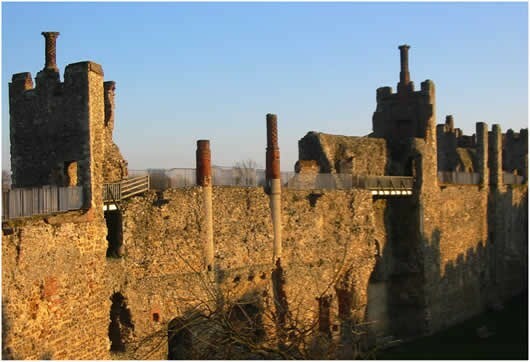 Framlingham Castle was given to Pembroke College as a philanthropic gesture in 1636, after which the internal buildings were taken down to make way for the construction of a poorhouse within the site. The castle was used in this way until 1839 when the facility was closed, the castle was then used as a drill hall and as a county court. In 1913, Pembroke College donated Framlingham to the Commisioner of Works and during WW2, Framlingham Castle was used by the British military as part of the regional defences against a potential German invasion. Today, Framlingham Castle is a scheduled monument and a grade 1 listed building owned by English Heritage and run as a tourist attraction. Free parking is available in the church car park at St Michael’s Rooms, next to the church, just before the castle. A courtesy wall safe is provided for donations. The nearest rail links are Ipswich, Woodbridge and Stowmarket. By car, from the north, take the A14, signposted to Felixstowe. Shortly after Stowmarket, take the A1120 Stowupland turn off & follow the A1120 to Saxtead Green, and then take the B119 to Framlingham. On entering Framlingham, follow signs to the town centre and the church is just past the market hill on the left. From the south, take the A12 to Ipswich, join the A14 to Felixtowe & then rejoin the A12 signposted to Lowestoft. Shortly after Woodbridge, leave the A12 on the B116 to Framlingham. On entering Framlingham, follow the signs to the town centre, the church is just past the market hill on the left.